Each season has its own charm however summer is that time of the year which just fills us all with joy and a sense of calm. Since the weather is mostly comfortable we are able to get a lot more things done than during the winters. If you are a student on vacation then you could either choose whiling away your time doing nothing or do something productive over the time, here is a comprehensive list of productive things to do during summer break. The following mentioned are few tips on what to do over summer break and some outdoor summer activities or things to do this summer. Come the summer and the first thought that sweeps across most people’s mind is the ideas for summer camp. Browse the internet and it will surely not take you very long to find a summer camp that is being organized. In addition to this you could take it upon yourself to organize a trip with your friends and family. You can rest assured that you are going to make it a really memorable summer and the joy and delight will really stay with you even when the summers are long over. Learning a new language is something that we all say that we want to do, however, it is something we never actually take the time out for. The summers are a great time to actually follow your heart and do things that you have long been dreaming of. Whether the language you want to learn is French, Spanish, German, Chinese or even Greek, stop thinking about it and just get down to it. You can learn it online, free of cost or even hire a private tutor to help you along the way. Summer is that time of the year where people like to kick back and have a little fun. Though dancing is definitely fun thing to do, it is also a great way to de-stress yourself. Ask anyone who has taken up a Zumba, Rumba, Salsa, Tango or even Hip Hop dance class and they will tell you what a blast they have. In addition to this all those who have wanted to shed some kilos would be glad to learn that dance helps you lose weight fast and without any deliberate efforts at all! Most people use the period of summers to work out and get fit. In this day and age no one can afford to be unhealthy or they will certainly not be able to make it through the day without feeling too drained. Initially some people might find exercising very tough on their body however over time they will know that it really helps. In addition to this you could also use the time to implement a new healthy diet chart which could really help you have a healthy body and a happy life. Instead of focusing on your own self this summer, it would mean so much more when you actually go a step further to be generous with your time and energy when it comes to helping others who have no one. There are so many people in our very own locality who could be struggling with so many kinds of problems but have no shoulder to cry on. In your own little way you could be that person that does his or her own little bit to help those who are less fortunate than you. Whiling away your summer doing nothing at all is boring especially because you will have no particular reason to get up in the morning. Taking up a project of any kind could really give you some purpose so that you end up doing some productive activities with your time. The project could be, building a tree house, painting a portrait, or even setting up a blog. Doing things like this could really help you find your talents and you never know you might find your career field in this way! Going on vacation is great to get away and de-stress yourself during the summer. Instead of being cooped up in your house, you could go globetrotting alone or with your entire family. Travelling is indeed an enriching experience and the thrill of trying out a new dish or encountering a breath taking scenery is indeed priceless. In addition to learning a lot of new things about various cultures you will also be able to spend quality time with loved ones. If you prefer not to take a vacation you could spend your time getting to know your own city better. While working or schooling you might never have the time to actually go and explore even the neighborhood which you reside at. You might look at a lot of things on your way to and from work; however you do not actually see them. The best way to explore a place is walking; however you could always use public means of transport or even your own car! Redecorating your house is one of the best things to do in summer. In winter we all get a little lazy and painting the house during the monsoon season is always a bad idea, so this naturally leaves summer. Summer months is definitely the best time to paint your house because not only do you have free time on your hands but the weather is also incredibly conducive. Rather than hiring a number or workers, you could try and do the job on your own or even with a few of your close friends and it will certainly be a lot of fun. Playing an instrument is something we all promise ourselves which we are going to do, however, we always make up excuses saying, now is not the right time. Come the season of summer and you should stop making these excuses and just get down to it. Initially it might be tough and even a little daunting however over time and with a little practice you are bound to pick up a great deal and turn into a great musician, all it takes is a little diligence on your part. The summer break is a great time to get in touch with your inner self and get to know yourself a little better. During school time or even during work days you might not get the time to spend quiet moments engrossed in your own thoughts however during summer, instead of being caught up in a whirl wind of activity or even spending countless hours in front of the television or computer, the most productive thing to do would be finding yourself. One of the most productive ways to spend your summer would certainly be taking up an internship with some reputed company. No matter how little the pay is, or even if you work for free you should take it up just for the mere experience of it. This is the way in which most people find out where their passions is. Even though we might be interested in something we might not necessarily have the aptitude for it, doing an internship really lets you know where your strengths truly lie. Living in the present and making the most of it is important however at the same time it is wise to think ahead, in terms of your future plans and goals. It is not that you ought to have your full life chalked out before you because it is never possible to know what life might throw at you, yet you might want to spend some of your time thinking about which direction you would like to head out to in the future and what are the options open for you. During working days its no secret that all of us keep hoarding up work which we do not feel like doing, but ought to do, the summers are a good time to actually buckle down and do these jobs because sooner or later they do need to be done! 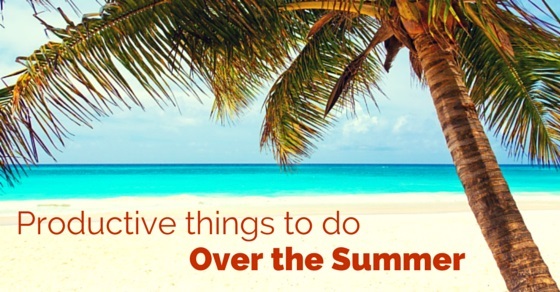 These are a number of productive things that anyone could do over the summer. Needless to say, the summers are a great time to de-stress yourself as well as get to know who you really are as a person and what it is that you believe in. In life, many people are going to try and put you down but if you know your own capabilities and believe in yourself then no one and nothing will be able to break you down no matter how much they try to do so. Next articleFiring Someone within Ninety Days – When can you do that?